Beat the entrance lines and delve deep into Spain’s art history on this 1.5-hour private tour of Madrid’s Reina Sofía Museum. The lines to enter this city highlight can be greater than an hour, so fast track your entrance and gain quick access to the art on show with a private guide. The museum houses work from some of Spain’s finest 20th-century artists, including Pablo Picasso and Salvador Dalí. 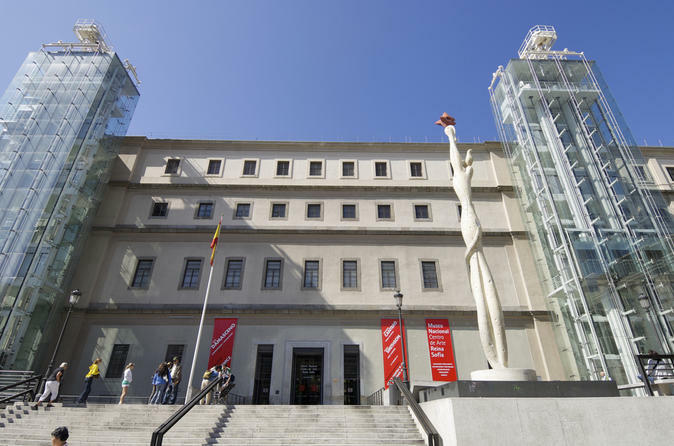 Madrid’s Reina Sofía Museum is housed in an elegant old hospital building, and its vaulted hallways are the ideal place to discover many of Spain’s finest artists and sculptors. Meet your guide inside the museum and begin your discovery of 20th-century Spanish art, from abstractionism to cubism, surrealism to modernism. Listen to your private guide explain the fascinating history of the grand building that now houses the museum’s many works, and hear how it was first put to use around 200 years ago. Today, Reina Sofía Museum holds a large number of works by many Spanish artists who made their mark during the course of the 20th century. Explore the hallways and galleries with your guide, and learn how and why these talented people created their art. Spend time admiring works by artistic luminaries such as Madrid-born Juan Gris, a shining light of the Cubist movement. Learn of the life and work of accomplished painter and sculptor Joan Miró, a master of abstract Surrealism. If there is anything particular that you are interested in, simply let your guide know. One of the benefits of having a private guide is that the commentary is tailored to your interests. Marvel at Picasso’s masterpiece Guernica, one of the main highlights of the entire museum. This painting, a protest against fascism and the horrors of war, is one of the most valued pieces in the museum. Study the monotone shades employed in the work, and hear what the abstract shapes represented to its talented creator. As you continue on your tour through the museum, look out for works from the famous Surrealist painter Dalí. Your tour also covers artists such as sculptor Julio González and the contemporary artist Antoni Tàpies, two of the most talented and influential Spanish painters and sculptors of their time. Look out for works from artists from other parts of the world, too, including Francis Bacon and Georges Braque. After 1.5 hours exploring the museum, your tour concludes back near the main entrance.